to high school students at Notre Dame University in South Bend, Indiana. It is a week-long adventure in faith on the college campus. Students attend events, workshops, and activities during the week with other high school students from all over the country. They stay in the dorms on campus and eat meals in the dining halls. 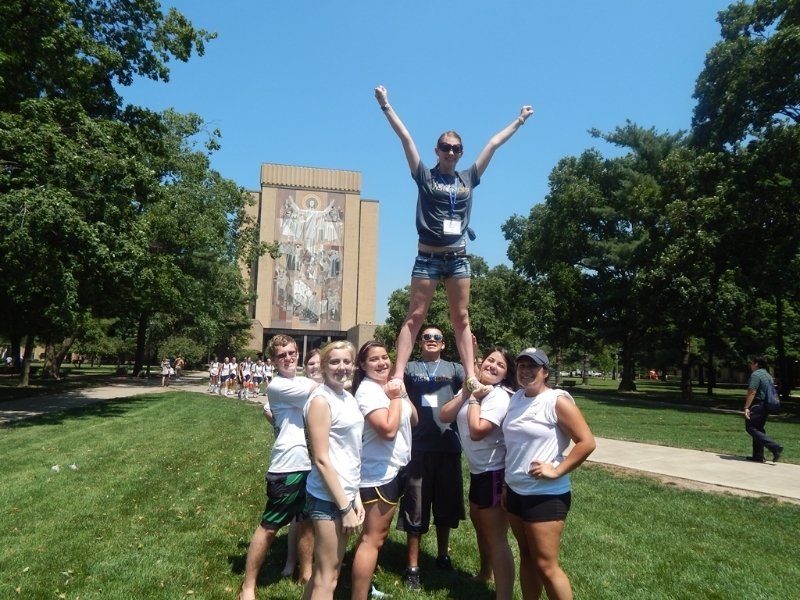 Over the past four years we have sent groups of students to the Notre Dame Vision Youth Conference and each one of them have had such a remarkable experience that they talked about with highest regard. It is an opportunity that they were so grateful for and one that has influenced their lives. The next trip that we will be attending is July 2019. We would like to attend Week #3 July 8-12. We have been so fortunate that our students have been able to raise money through fund raising and grants to pay for the trip. The students are chaperoned by teachers in our program and they travel together to Indiana. Our students travel by a chartered bus for our group. We will have plans for fund raisers to sell pizza fritta, Gertrude Hawk candy, and other events to help us raise money to defray the cost of the trip. We hope that you will encourage your high school student to consider attending the Notre Dame Vision Youth Conference. It is open to any youth who will be entering the 9th grade in the fall of 2019 through those who would have graduated in June of 2019. There is an early deadline is April 6, with discounted rates as well as securing the week that we want. The conference does fill up fast. If you would like further information you can visit their website at http://vision.nd.edu. If you have any questions or need more details, please contact me. THANK you for considering this wonderful experience for your son/daughter.